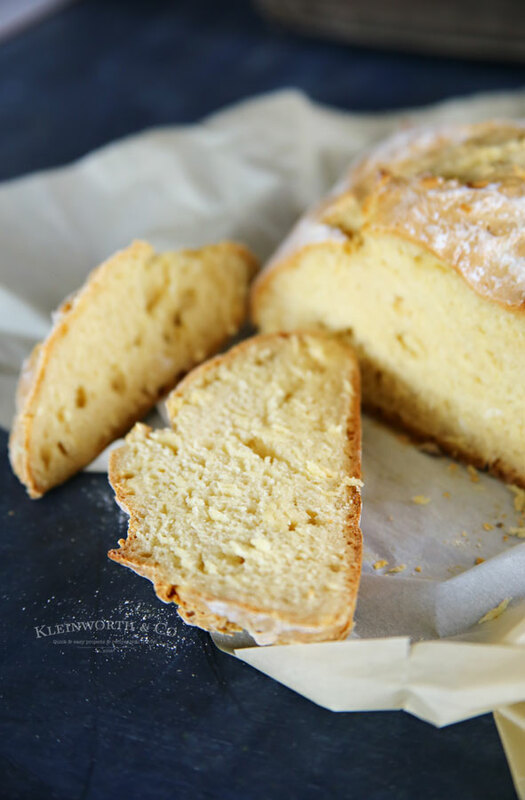 St. Patrick’s Day Irish Soda Bread Recipe is one of those easy to make, 4-ingredient bread recipes that will have you coming back for more. So simple, no yeast & oh so delicious. 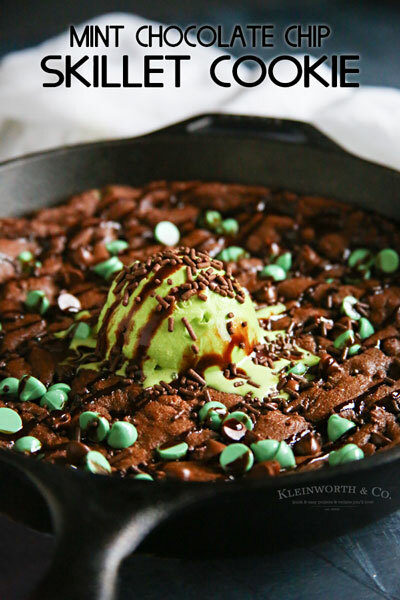 Perfect for St. Patrick’s Day! I originally had something else planned for today. But then I was given a little inspiration on Sunday & Monday that prompted me to dig into my Irish heritage & create something to get a little closer to it. I decided that since I had never made Irish Soda Bread before I would give it a try. I pulled a few different recipes & then sort of compiled them into what would work for me & the ingredients I had on hand along with how I like to bake. The end result was so much better than expected. 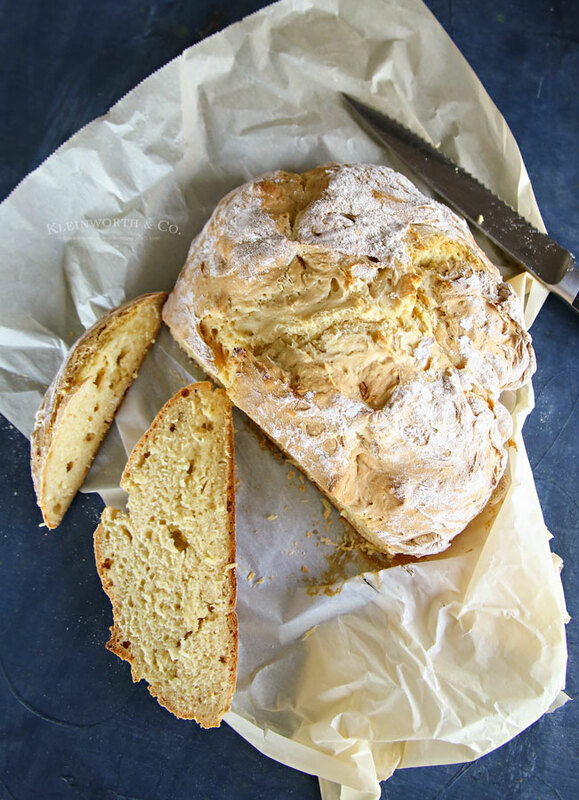 This has now become one of my easiest & most loved bread recipes we make. 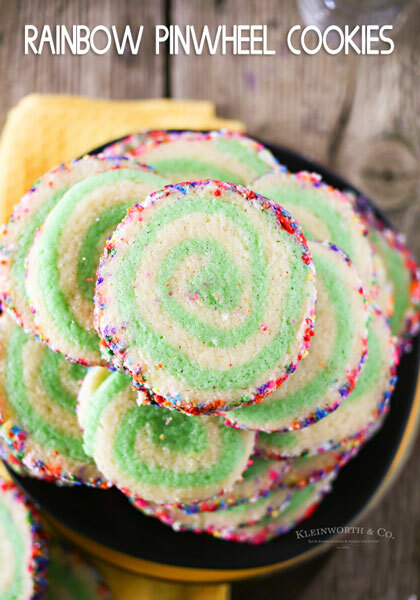 This is so simple & we make it all the time- even when it’s not St. Patrick’s Day. The kids are loving it as toast (with the raspberry marmalade on it) for breakfast at the moment. But it goes great on the side of meatloaf & mashed potatoes or with a hot bowl of soup. 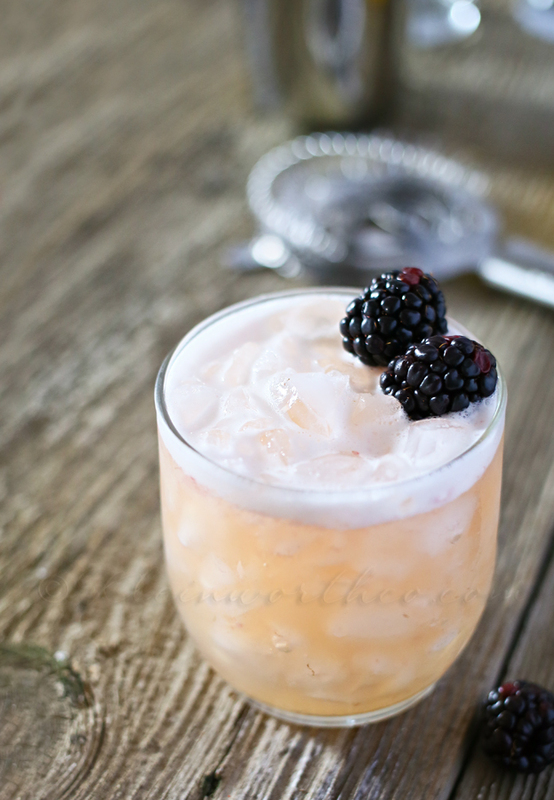 With just 4 ingredients & no yeast or rising time required, you can’t go wrong with this. 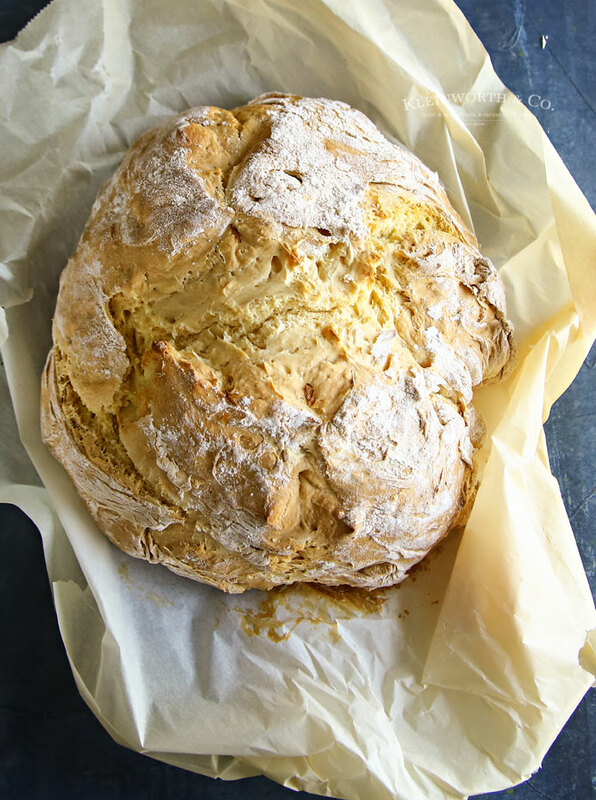 HOW DO YOU MAKE Irish Soda Bread? Lay a sheet of parchment paper over baking sheet. Set aside. Mix flour, salt & baking soda together in mixer bowl. Make a well in the center- pour in your buttermilk. Mix with the paddle attachment of your mixer or you can kneed in by hand until the dough is soft. Should be fairly wet but not sticky. Turn dough on lightly floured surface & kneed 3-4 times to smooth. Shape into flat circle – mine was about 1-2 inches thick but still flat in shape. Place on prepared parchment lined sheet & cut a cross from edge to edge on top. Bake 25-30 minutes or until golden. When it sounds hollow when tapped- it’s ready. I just love the artisan style of the round loaf. It looks so rustic & hearty. 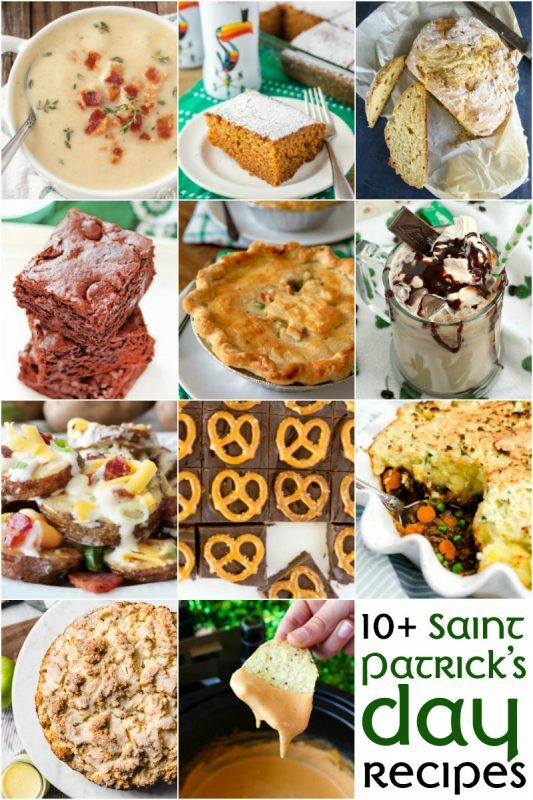 Looking for more great St. Patrick’s Day Recipes? Shape into flat circle - mine was about 1-2 inches thick but still flat in shape. Bake 25-30 minutes or until golden. When it sounds hollow when tapped- it's ready. **If you don't have buttermilk (which I didn't) you can put 1-3/4 tbsp vinegar in measuring cup & then fill the rest with regular milk until you reach 1-3/4 cup. Let sit for 5 minutes before mixing in. I don’t think I’ve ever had this! I wonder if it would turn out with gf flour? I made Irish Soda Bread for the first time a year ago. It’s a fun hearty bread and I have intentions of making it later this week. Your recipe is very similar to the recipe I use. Yum! What a beautifully rustic loaf! It looks delicious. I may have to give this a try! Oh boy. That looks wonderful! You totally had me at that first shot! That looks awesome. Re; buttermilk replacement. 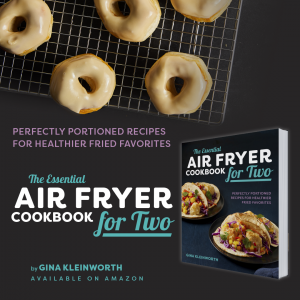 My friend told me that when she’s out of buttermilk, she simply substitutes with plain yogurt –in the same amount as required for the buttermilk. I swear I can smell it, Gina. Amazing! 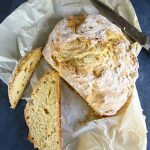 I love soda bread, but haven’t ever made it myself! I’ll have to try this! That sounds so easy and so good! Will definitely have to try. Pinned! When you mentioned regular milk, is that including skim milk? I have stumbled across your recipe and have very thing but the buttermilk. Thanks!! Thanks for the recipe Gina!! It was so easy and turned out beautiful!! I’m so glad you posted this and nudged me to give it a try!! We’ve had it this week with our hearty potato soup as well as toasted with butter and honey! This loaf of bread looks so good. 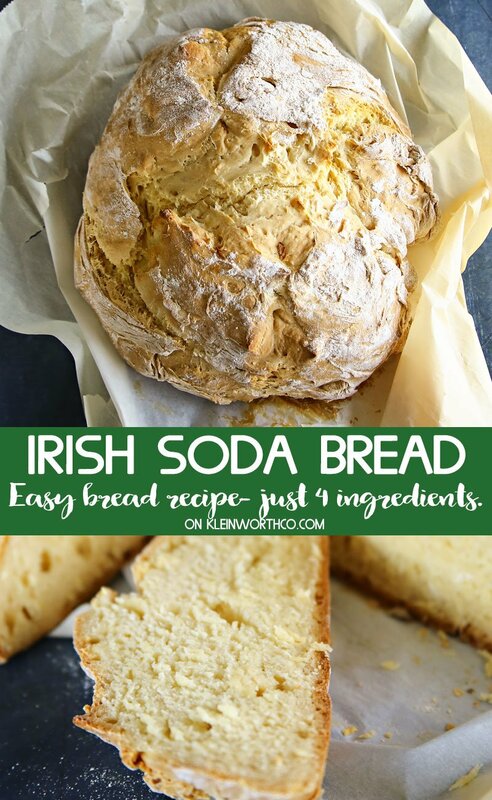 I have never had Irish Soda Bread, but I think I will have to give it a try! I am off to read about the jam! Thanks for linking up to the In and Out of the Kitchen party. I am so glad you brought this recipe and I look forward to seeing what you come up with next week.